Comm Eye Health Vol. 18 No. 55 2005 pp 101 - 104. Published online 01 October 2005. Consultant, Division of Ophthalmology, Groote Schuur Hospital and University of Cape Town, Private Bag, Observatory, 7937, South Africa. prompt referral of serious injuries requiring specialist management. Particular attention is required if a foreign body is involved or if the injury may have perforated the globe. 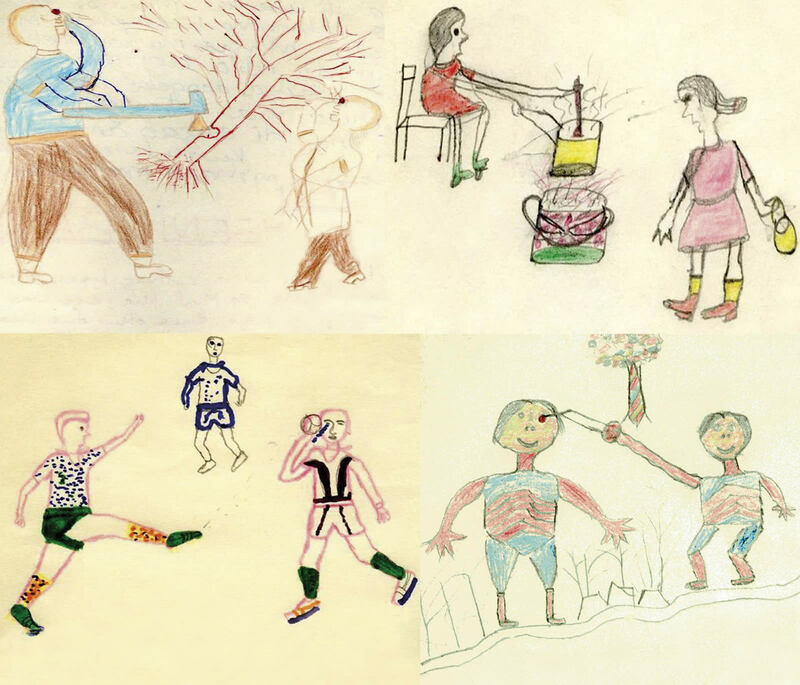 For example, a history of a blow to the eye by a broomstick suggests blunt trauma, but if the weapon was the tip of a rotten broomstick, one would look for a retained foreign body; if the fist was the weapon but the assailant was wearing a ring, one would look for lacerations to the globe as well as contusion or bruising of the lids and orbit. Human bites, or penetrating injuries caused by dirty or used kitchen utensils, may cause fulminant infection, so the patient should be treated with systemic antibiotics. 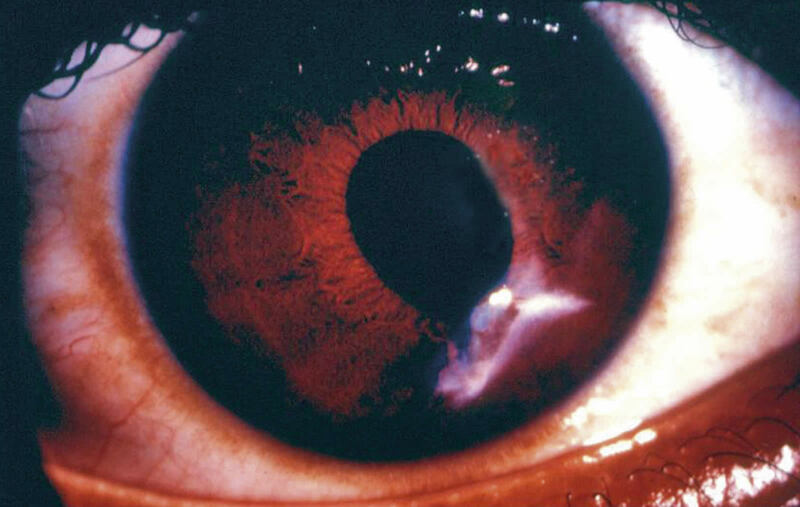 When metal hits metal (such as hammer and chisel), the velocity of the metal fragment is enough to leave the slightest of marks on the cornea as it tracks through the globe to the vitreous cavity, whereas the grit from a coal engine embeds itself in the corneal epithelium as a corneal foreign body. Intraocular foreign bodies, such as glass, may be inert but the reaction caused by a copper fragment can destroy the retina within days. With chemical injuries it is important to know the type of substance that caused the burn, and how long the substance had contact with the eye. An irritant such as pepper would cause discomfort but no actual damage, alkali and hydrofluoric acid burns are the most dangerous, while acid burns caused by chemicals with a low pH tend to be less severe than alkali burns. Prophylaxis for tetanus infection is required for a patient with lacerations, particularly if dirty. 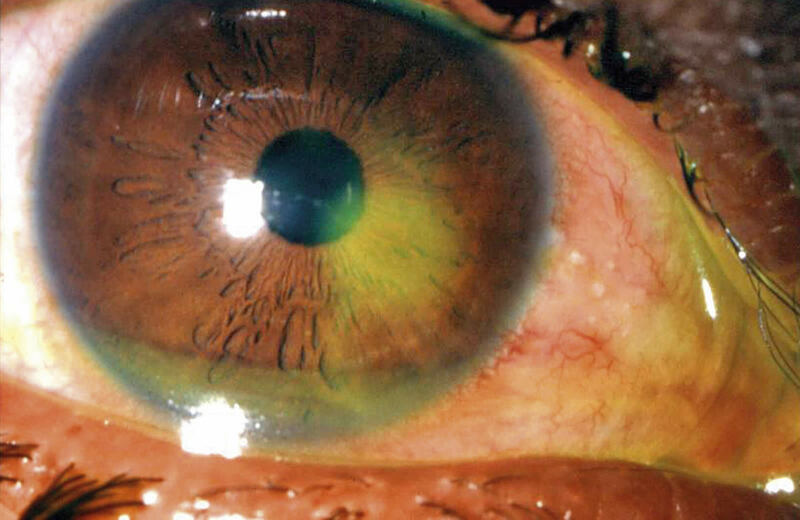 Corneal foreign bodies can be removed after adequate topical anaesthesia under magnification with good illumination. A corneal abrasion is often caused by a finger, resulting in an extremely painful eye that can be examined once topical anaesthetic has been instilled. Fluoroscein staining will indicate an epithelial defect (Figure 1). Management is with an antibiotic and eye padding for one day. Damage to the cornea may occur when welding without protective goggles. Diffuse punctate staining is visible over the whole cornea when stained with fluoroscein, and the symptoms are similar to that of a corneal abrasion, but usually in both eyes. Management is as for abrasion. Any open injury of the globe needs emergency referral to an eye specialist. A shield only should be placed over the injured eye – eye pads must not be used so as to avoid any pressure on the eye. A globe ruptured by blunt trauma (e.g. a blow by a fist) should be treated in the same way as a penetrating injury, even if the rupture injury is sub-conjunctival (Figure 2). Simple lacerations can be sutured. Septic lacerations should be cleaned and treated with systemic antibiotics. Delayed primary closure may be advisable. Lacerations involving the lid margins should also be referred to a specialist who is familiar with the technique of opposing the lid margins with fine precision. Medial canthus injuries should be assessed to see if there is a tear of the lower canaliculus (a lacrimal probe can be used). 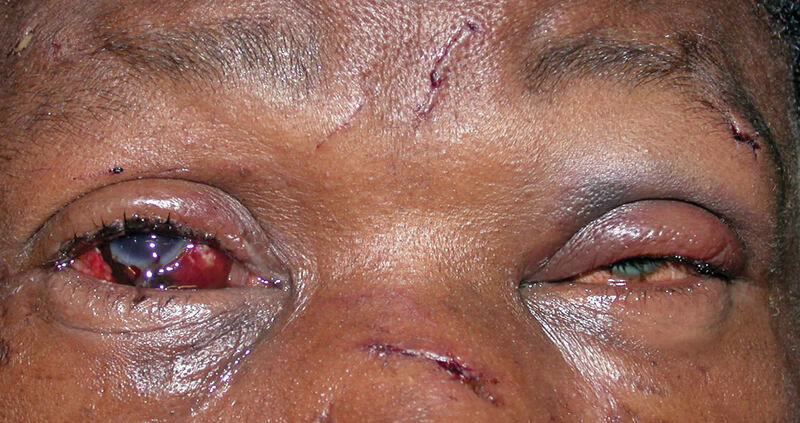 If damaged, the patient should be referred to an eye specialist for canalicular repair (Figure 3). 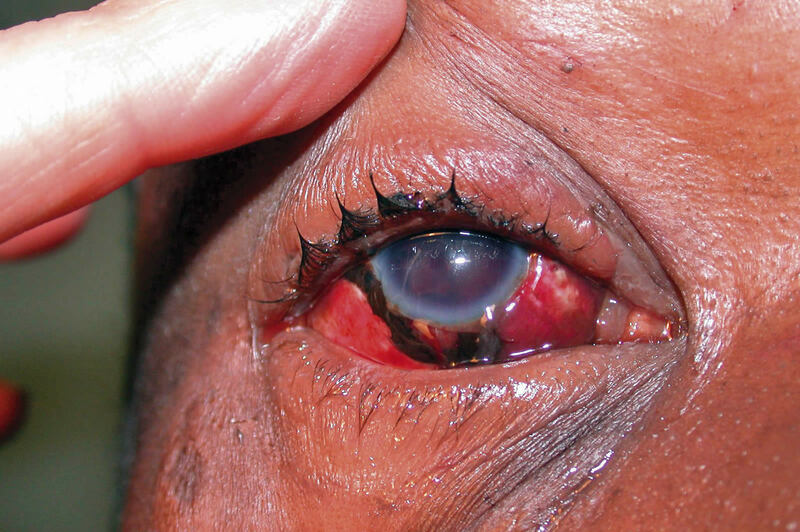 A sub-conjunctival haemorrhage is quite common after trauma and can be managed conservatively (Figure 4). sickle cell disease with failure of the hyphaema to resolve and raised IOP. The risk of further bleeding into the eye is increased by the use of aspirin, and may be decreased by topical steroids. Patients should be advised to avoid non-steroidal anti-inflammatory drugs for one week aftera hyphema. Vitreous haemorrhage is a sign of serious intraocular trauma, and is characterised by the loss of the red reflex compared with the other eye. All cases of vitreous haemorrhage should be referred for further examination to exclude globe rupture or perforation, or other sight-threatening complications such as retinal detachment (Figures 5 & 6). The lens may be subluxated or even dislocated. The intraocular pressure may increase in the acute phase and a lens extraction may be indicated. Both blunt and perforating injury may cause a cataract requiring extraction, either very soon after injury if it is causing complications, or later when the eye is quiet and recovered from the injury. Proptosis or diplopia (double vision) suggests serious eye injury for which specialist assessment and management is required. 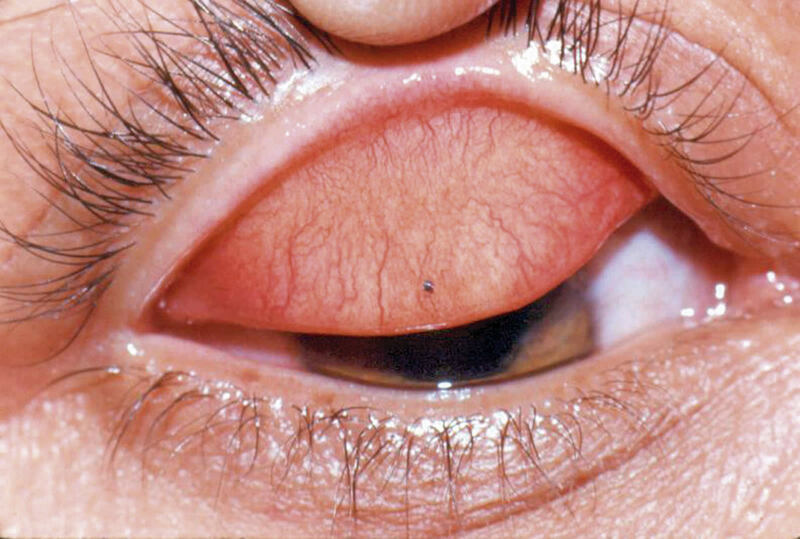 Burns to the eye may affect the eyelids, conjunctiva or cornea. It is important to keep the cornea moist and free from exposure. The first aid management is to apply antibiotic ointment generously all over the conjunctiva, cornea and burned eyelids. An eye pad should not be placed over the eye as this may ulcerate the cornea. The patient may require skin grafting of the eyelids. The first aid management of chemicals in the eye is immediate and profuse irrigation with clean water after instilling local anaesthetic drops. The patient should lie flat while water is poured into the eye generously for at least 15 minutes (see page 109). After this time the eye can be examined with fluorescein to see if there is any evidence of corneal ulceration. 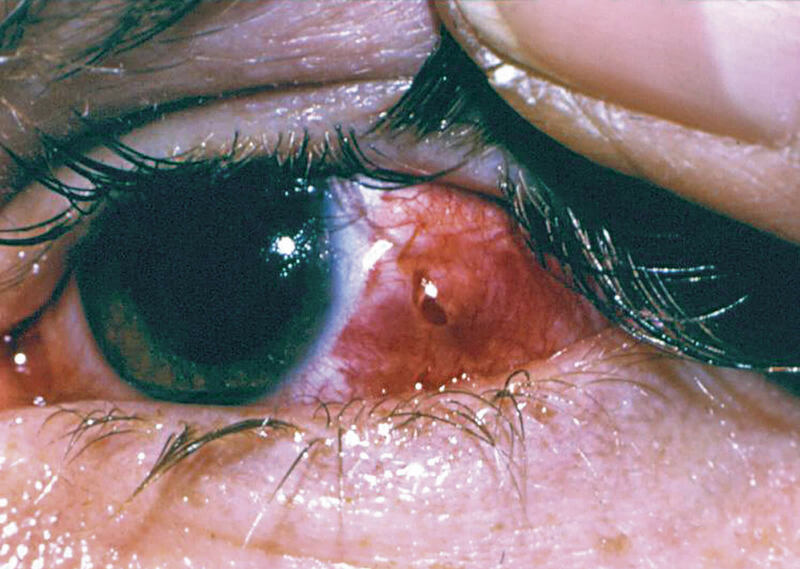 If there is ulceration, the patient should be given topical antibiotics, and an eye pad and seen daily. Many chemical injuries are caused by acid (e.g. exploding car battery), and these usually have a good prognosis as the acid damages only the superficial layers of the cornea. Alkali burns (e.g. ammonia) are less common, but much more severe. They should be referred to an ophthalmologist, as they will require intensive topical steroids, tetracycline and vitamin C drops. Eye removal – evisceration or enucleation? Managing ophthalmic trauma is challenging. Clinical and surgical skills and equipment vary from place to place and country to country so that the management of serious eye injury requires a variety of alternative strategies. In principle, if a health care worker can diagnose and treat a condition and recognise the complications, then he or she can manage that case. Corneal abrasions, conjunctival, tarsal, superficial corneal foreign bodies and small lid lacerations not involving the lid margins, can be managed by ophthalmic nurses and general practitioners. Injuries such as deep corneal foreign bodies and large hyphaemas should be managed in centres where slit lamp examinations can be performed and intraocular pressure (IOP) can be measured. Open globe injuries, lid lacerations involving the lid margin or canaliculi, blow out fractures with diplopia in the primary position and any potential intraocular foreign body should be referred to a well equipped eye care centre. 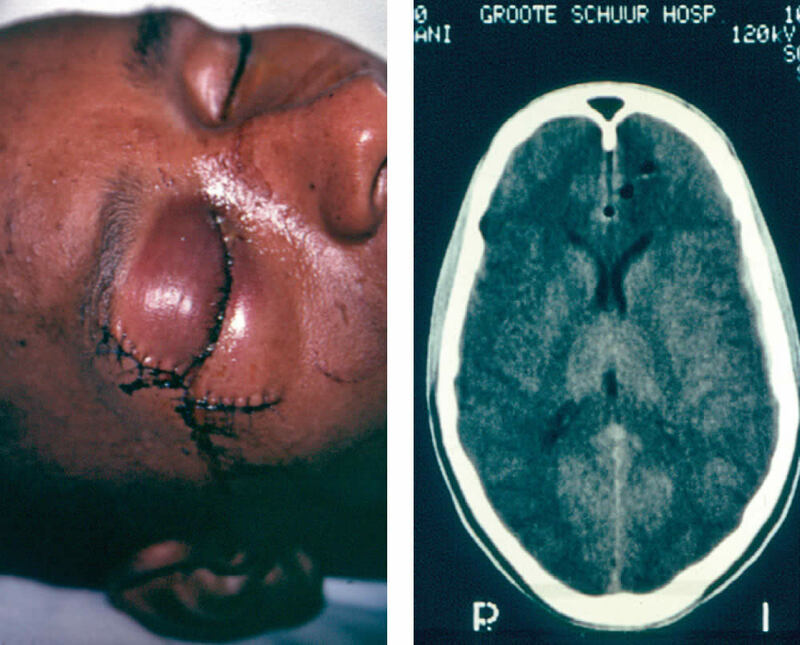 missed cranial injuries in sharp orbital trauma (Figures 8 & 9). 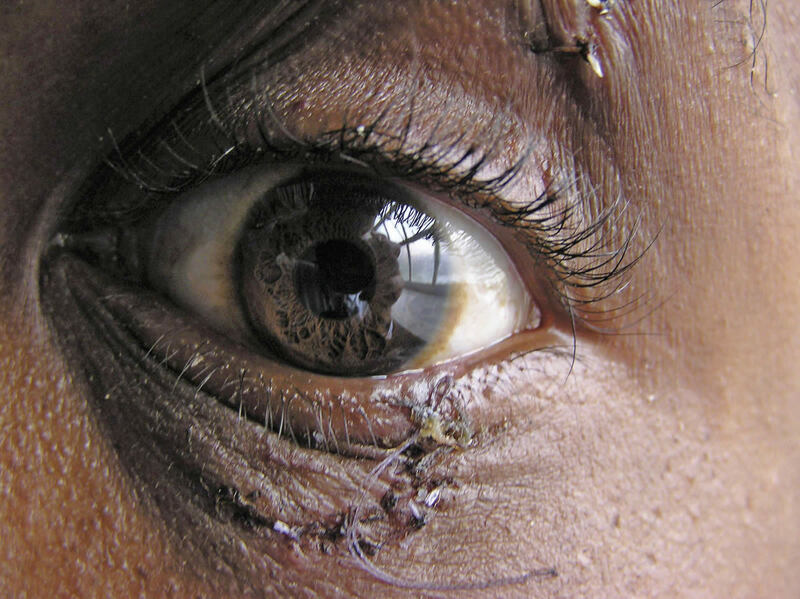 This editorial lays out guidelines on the assessment and management of trauma to the eye. Practitioners may manage patients differently according to the availability of equipment, skills, finances and transport.